What would happen if CYC no longer existed? Last year, CYC’s Board faced this question. The state’s budget impasse meant social services across the city were cut, and CYC lost critical funds. We faced difficult decisions. 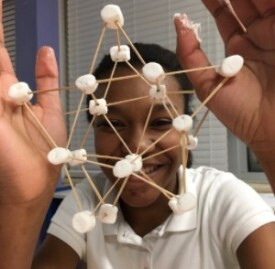 It was hard to believe that systems designed to support our children, families, and communities would ultimately fail them.As we grappled with how to overcome these challenges, we thought of Alainia in South Shore, who discovered her love of science after she built robots in the CYC Maker Lab. We thought of Roxane in CYC’s Arts & Innovation Club, who sold her first painting at a CYC gallery night in Bridgeport, where her mother noticed that her usually shy little girl was beaming with pride. We thought of the 2,000 extraordinary children in our programs and the countless family members who depend on CYC to help nurture and instruct them.We chose NOT to disrupt our programs, Centers, and communities. Amid the budget cuts, I am proud to report that not only did we sustain our programs; we grew. We developed innovative ways to teach children 21st century skills. We built our second Maker Lab in Bronzeville and began construction on our third in North Lawndale. The number of parents and guardians in our Family Engagement Program quadrupled. Enrollment in our Summer Enrichment Program doubled. 100% of our students advanced to the next grade level on time. Our youth demonstrated growth in critical thinking, creativity, communication, and collaboration skills. We established a system to track and analyze our results, and we expect to build on these outcomes in the coming year.As the new program year begins, I am so grateful for your continued support and the difference it makes for students like Alainia. In addition to creating her own experiments, Alainia teaches other children how to use technology in the Maker Lab. In fact, she has taken her CYC experience and confidence back to school: Alainia is now the assistant to her science teacher!We witness so many stories like Alainia’s. We watch the aspiring musician who is finally able to attend the symphony on a CYC field trip. We see the young boy who faces his fear of the water in the CYC pool and learns how to swim. We watch the beautiful four-year-old girl who can play safely and without fear. We watch children thrive.For the 2016-2017 program year, we have a clear vision: our children will be the last generation of their families to live in poverty and violence. They will continue to increase their critical thinking, communication, creativity, and collaboration skills. They will gain skills in STEAM (science, technology, engineering, arts, and mathematics) and learn how these skills can lead to a future career. They will discover—and realize—their potential.From entering kindergarten to beginning college, we watch our children grow. And we will continue to grow with them.